I confirm the exact same problem reported by user 5pence5, even with the updated version released mac beta shank 2, 2012-12-28. It crashes immediately when selecting a difficulty from campaign; screen goes dark then back to desktop and moments later it indicates that "shank2 quit unexpectedly". 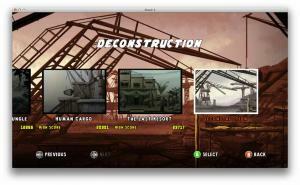 Guys, there actually is a new version of Shank 2 Mac uploaded dated on 12/28/12. If anyone already has it, can you tell us the release notes (or the Klei/Alternative Games guys)? You could. If you want 2GB of a previous Shank 2 beta sitting on your hard drive, then leave it.Anyways, bugs! In this new beta (Beta 11? 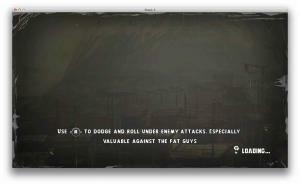 ), I found some.-Controller cannot control menu (main menu, pause menu, skip cutscene menu, and so on. )-Fire effect still looks off. (See: Inferno Fight)-Controller prompts, while mostly fixed, still sometimes don't display the right button. "|" is placed where a controller button should be.-Encountered a random (?) crash in the third stage. Just suddenly crashed and I don't have the log file because it didn't save.-Mac version still does not save.-Some slowdown with Fire effects (Is it possible for the Alternative Games/Klei team to make more optimizations to the game for smoother gameplay? )-Are the cutscenes supposed to be really small (in terms of vertical height)?-Survival Mode still does not work offline (Needs Steam Client? )-Survival Mode "How to Survive" has somewhat-poor video quality (intentional?) and the audio sometimes cuts out.Anyways, despite all of these bugs, it works pretty damn well. Camera bug is fixed, the cutscene bug is fixed, and controller mostly works. Good job Alternative Games/Klei! Just keep it up!EDIT: I tried registering Shank 2 via Add a non-Steam Game, but the overlay doesn't appear. I can't take photos of these bugs. Any good way I can take photos while the game is still running? The Grab utility doesn't seem to want to work with me while Shank 2 is running. Thanks for update #2! Only played through the first level to see if the camera bug and save bug had been resolved, there were no camera issues and I can also view the level 1 finale video now. I can confirm that the save bug is still present -- didn't save settings, stats, or game progress. It continues to save my files to "Shank2/users" rather than just Shank2. Mac version stores log files and savegames to <username>/Library/Klei/Shank2, Linux version to ~/.klei/shank2. -Gamepad/joystick controllers should now function properly (Fixed already in Update 1). -Camera problems on Mac should be resolved. -Savegames should function properly on Linux, Mac might still have problems. -Gamepad/joystick button icons should be more sensible, if not yet totally correct. -Fixed minor glitch in blur effect. -Fixed resolution listing in display mode selection. Yeah, maybe I'm just seeing things. Have you played up to the 3rd Stage yet? Throughout the stage, it crashed for me, and I was wondering if you had run into this crash as well. I didn't play through the whole stage because it wouldn't save anyway but I got maybe halfway without crashes. I can confirm the save game issues: no save game progress, so stats, no unlocked items, no control settings are saved. Alright, so there is a crash on the 3rd stage for me. It's after the breakable planks and the enemies that shoot. If I try to progress further than the plank section, it just straight up crashes and returns me to the desktop. Anyone else play far enough to get this issue? Hey guys, there's actually a new update out. It supposedly fixes the glitch in level 3, and the changelog is in this link. Tried Update 3, thanks Shank 2 team. Everything works as the changelog says it will, which also means still no saves. Made it up to the level 4 boss and had to quit after a couple of deaths, I'll probably hold off on playing through again until the save issue resolved. I think there's another update to the Shank 2 beta for Mac. I'm currently downloading it and going to check on the changelog. Alternative Games is really fast at pushing these updates out! EDIT: Here's the changelog! Mac saving is in now! Unfortunately, it seems that the controller buttons are just the generic buttons. No 360 pad buttons here. 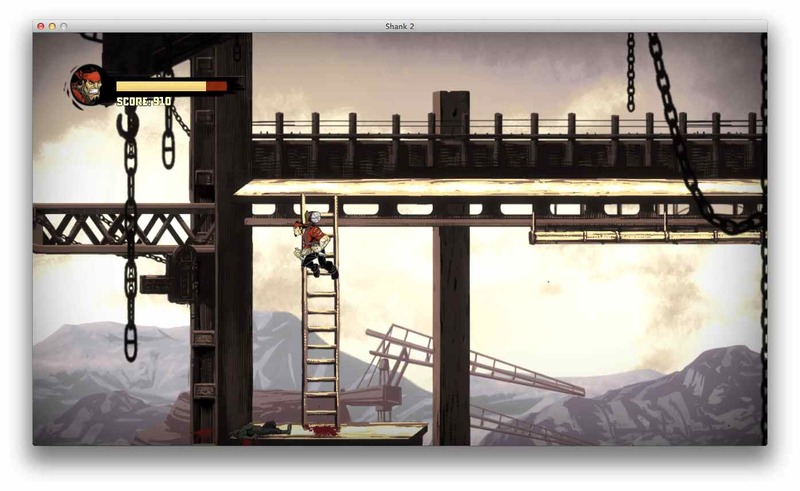 Shank 2 Mac update 4====================Notes:Mac version stores log files to <username>/Library/Klei/Shank2 and savegames to <username>/Library/Klei/Shank2/users.Linux version stores log files to ~/.klei/shank2 and savegames to ~/.klei/shank2/users.Known issues:-Local survival mode doesn't work on Mac.-Mac version is not digitally signed.-Some incorrect controller button icons.Changelog:Shank 2 Mac update 4 (3 January 2013)-Mac version now loads saved games properly. Also controller settings are saved and loaded correctly. The issues were caused by problems in handling binary files on Mac.Shank 2 Linux/Mac update 3 (2 January 2013)-Fixed crash on third level.-Game now writes log files (rendering.log lists available OpenGL extensions).-Added an icon for Linux version.Shank 2 Linux/Mac update 2 (27 December 2012)-Camera problems on Mac should be resolved.-Savegames should function properly on Linux, Mac might still have problems.-Gamepad/joystick button icons should be more sensible, if not yet totally correct.-Fixed minor glitch in blur effect.-Fixed resolution listing in display mode selection.Shank 2 Linux/Mac update 1 (21 December 2012)-Gamepad/joystick controllers should now function properly. I can confirm this bug. At the beginning of mission "Human Cargo", at the second boat with enemies the game crashes - no workaround. A new update is out! Thank you Klei developers you have done a magnificant job! This means that your internet connection isn't very fast, or someone else is using your internet and taking up a lot of the bandwith. I was able to get around 250kb/s for the download.Anyways, this release is pretty damn good. I can play through most of the levels now. Alternative Games added more controller buttons for the icons, as seen in these two photos: But, there is a glitch in the final level, "Deconstruction." When Shank tries to go up a specific ladder, he cannot, as the game just makes him drop back down. I cannot go up the ladder and am stuck in the same place. The ladder comes after a fight between two small grenadiers and a heavy enemy. I tried to get photo evidence of it, but it isn't photographed easily. 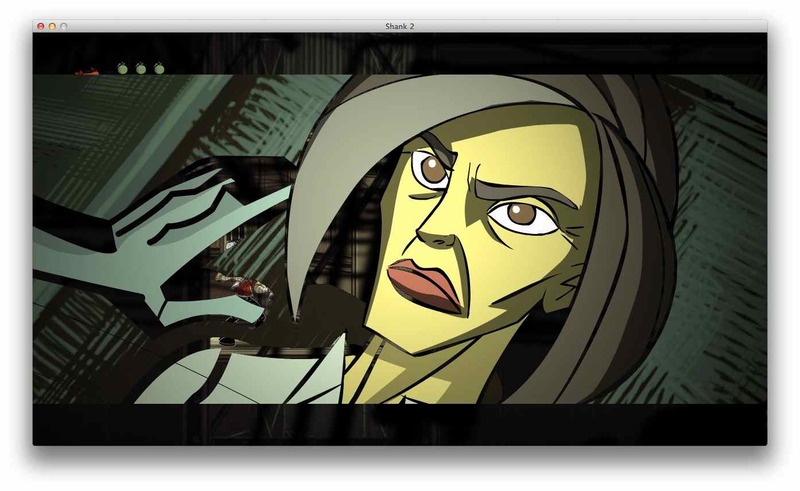 This is what happens, though: Also, in the stage "The Last Resort," there's a cutscene glitch. When the cutscene plays, one can see outlines of Shank riding the elevator, even though the cutscene should completely cover that up.EDIT: Here's the bug in question: Additionally, some more frame rate improvements would be much appreciated because there are still some parts of the game that could greatly benefit from it. Some portions of "Human Cargo" and the little scene in the second stage involving the big guy talking to the radio in a burning building can be improved in terms of frame rate. My computer especially slows down in the latter scene! I had the same problem in the cutscene and the water in the same level was really blocky, not sure about you guys though.I can confirm the ladder issue!